Grouse are a group of birds from the order Galliformes. Grouse inhabit temperate and subarctic regions of the northern hemisphere. These heavily built birds have legs feathered to the toes. The Red Grouse is considered a game bird and is shot in large numbers during the shooting season which traditionally starts on the 12th of August, known as the Glorious Twelfth. Shooting can take the form of 'walked up' (where hunters walk across the moor to flush grouse and take a shot) or 'driven' (where grouse are driven, often in large numbers by 'beaters' towards the guns who are hiding behind a line of 'butts'). Many moors are intensively managed to increase the density of grouse. Areas of heather are subjected to controlled burning; this allows fresh young shoots to regenerate which are favored by the grouse. 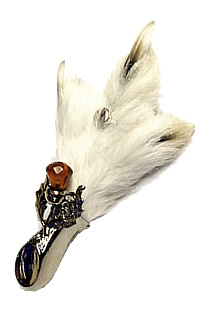 Wearing the grouse foot is supposed to bring good luck to the hunt (not to the Grouse). Examples of the Grouse-foot kilt pin appear as early as the 1800s and may have been part of the Victorian resurgence of Highland attire. Elaborate examples include sterling silver mounts. Some examples are stamped with the term MIZPAH. Mizpah is an emotional bond between people who are separated (either physically or by death). Mizpah jewellery is worn to signify this bond. Mizpah is a Hebrew word meaning: "wherever you are, may good fortune be with you". An unreliable source told me that the Grouse-foot kilt pin was a sign of defiance since hunting on the Lairds land was an offense with heavy punishments, and that the “ring” on the middle “finger” of the foot was the origins of “flipping the bird.” Well…it’s a good story.